Sir Georg Solti, KBE (October 21, 1912 - September 5, 1997), was a world-renowned Hungarian-British orchestral and operatic conductor associated in later life with the Chicago Symphony Orchestra. The winner of more Grammy Awards than any other person, he is regarded as one of the supreme practitioners in the art of conducting. Best-known as a specialist in late Romantic music, Solti remained open to innovation and was noted for introducing the works of many contemporary composers. Fastidious in the recording studio out of concern for technical accuracy, he was nevertheless widely hailed for his ability to convey deeply felt emotions in the works of such composers as Beethoven, Schubert, Wagner, Richard Strauss, and Mahler. After a promising career in his native Hungary, Solti spent the war years of World War II in Swiss exile due to his Jewish parentage. There, he won acclaim as a pianist but could not pursue his conducting career. After the war, he had several successful appointments as a conductor in Germany, leading to his tenure as music director of the Royal Opera House in London during the 60s, where he introduced British audiences to modern composers and launched his pioneering and enduring partnership with Decca Records. Solti directed the Chicago Symphony Orchestra from 1969 until 1991 and continued conducting it until his death. He also worked with several prestigious European orchestras and created a vast number of studio recordings, resulting an the largest number of Grammy Awards ever given to one person. In 1996, Solti was honored with a lifetime achievement award from the National Academy of Recording Arts and Sciences. He died suddenly, in 1997, just before his eighty-fifth birthday, and shortly before what would have been his one-thousandth performance with the Chicago Symphony Orchestra. Solti was born György Stern to a Jewish family in Budapest. His father later Germanized young György's given name to Georg and changed the family name to Solti to shield his son from growing antisemitism. As a boy, Solti learned the piano and studied at the Franz Liszt Academy of Music. It was there that he met the iconic Hungarian composer, Bela Bartok. Upon hearing an orchestra performance conducted by Erich Kleiber when he was 13, Solti decided that conducting would be his life. He would also study with other important Hungarian musicians, including Zoltan Kodaly and Erno von Dohnanyi. By 1935, Solti began to gain recognition as a conductor. He served as an assistant conductor to the Italian maestro, Arturo Toscanini from 1936-37 and made his debut at the Budapest Opera in 1938, with The Marriage of Figaro. In 1939, with German invasion imminent, he fled Hungary, knowing that his Jewish ancestry would endanger both his career and his life. 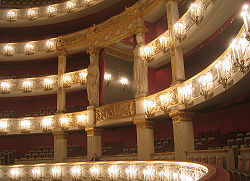 The National Theater in Munich, home to the Bavarian State Opera. Solti moved to neutral Switzerland, where he continued working as a pianist but had limited opportunities to develop his conducting career. He remained exiled in Switzerland thought the war years. In 1946, he won first prize in the Geneva International Piano Competition. In Zurich, Solti met his first wife, Hedi Oechsli. After World War II, he traveled to Germany to seek conducting opportunities, only to find much of the country in ruins. During this time, Solti was invited by the American military government to conduct Beethoven's Fidelio in Munich. He was then appointed music director of the Bavarian State Opera in Munich. There, he famously gave the German premiere of Paul Hindemith's opera, Mathis der Maler, which had been banned under the Nazi regime. He also directed the Frankfurt Opera. Solti's numerous successes in Germany would also lead to opportunities in other major European opera houses and festivals. In 1947, he signed his first recording contract with the prestigious Decca label, a relationship that would span 50 years, making it the longest conductor/record-label relationship ever. While at Decca, he made more than 300 recordings, including over 40 operas. In 1951, he made his debut at the Salzburg Festival, conducting Mozart's Idomeneo. 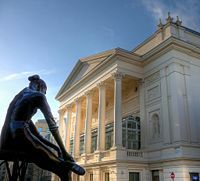 The Royal Opera House in Covent Garden, London. From 1961 to 1971, Solti served as the music director of the Royal Opera House in Covent Garden, London. In this period, he began to introduce British audiences to contemporary opera. He was also devoted to the recording of modern English composers, including the four symphonies of Sir Michael Tippett, perhaps England's most notable twentieth century composer. During his tenure at Covent Garden, he achieved international fame for his performances of Richard Strauss's opera Die Frau ohne Schatten, the British premiere of Arnold Schoenberg's ground-breaking atonal opera Moses and Aron, and Richard Wagner's epic "Ring Cycle," Der Ring des Nibelungen. He also recorded the entire Ring Cycle with the Vienna Philharmonic, a historic recoding project that required seven years to complete. Meanwhile, Solti's first marriage ended in divorce. His second marriage was to Valerie Pitts, a British television presenter, whom he met when she was assigned to interview him. They had two daughters. In 1972, he became a naturalized citizen of the United Kingdom. He had been awarded an honorary Order of the British Empire (knighthood) in 1971, and was known as "Sir Georg Solti" after his naturalization. During his time in England, Solti was a great supporter and mentor to many young musicians, including the fiery Hungarian soprano Sylvia Sass, with whom he recorded Mozart's Don Giovanni and Bartok's brooding one act opera Bluebeard's Castle. Solti was music director of the Chicago Symphony Orchestra (CSO) from 1969 until 1991. Afterward, he was made the first and only Music Director Laureate in that orchestra's history. He also led the CSO on numerous international tours, including a performance at the famed Tchaikovsky Conservatory in Moscow. During the same period, he was music director of the Orchestre de Paris from 1972 until 1975. From 1979 until 1983, he was principal conductor of the London Philharmonic Orchestra. Despite this energetic international schedule, Solti was as active in making music in the recording studio as he was in the opera house or concert hall. His long and productive partnership with the legendary producer John Culshaw at Decca continued through his tenure with the CSO. In addition to the first-ever studio recording of Wagner's Der Ring des Nibelungen with the Vienna Philharmonic Orchestra, groundbreaking products of this partnership included studio recordings of the operas of Richard Strauss. Both the Strauss and Wagner recordings have been remastered and released on CD, and they are still praised for their musicianship and expert production values. Solti's performances and recordings of works by Verdi, Mahler, and Bartók, were also widely admired. Using both the Chicago Symphony Orchestra, the London Philharmonic Orchestra, as well as the Vienna Philharmonic Orchestra, he recorded an extensive symphonic repertoire including the complete symphonies of Beethoven, Brahms, Bruckner, Elgar, Schumann, and Mahler. He continued to add new works to his repertoire in the latter days of his career, voicing particular enthusiasm for the music of Shostakovich, whom he admittedly failed to appreciate fully during the composer's lifetime. Solti never actually retired, and his sudden death in 1997 meant that several years of planned performances and recording projects would never be realized. In total, Solti conducted 999 performances with the CSO. Performance number 1,000 was scheduled to be in October 1997, around the time of his eighty-fifth birthday. According to his last wish, he was buried in Hungarian soil. After a state funeral, his body was placed beside that of Béla Bartók, his one-time tutor and mentor. Solti co-wrote his memoirs with Harvey Sachs, published in the UK as Solti on Solti and in the U.S. as Memoirs. The book appeared the month after his death. Sir Georg Solti was one of several important Hungarian conductors whose talents and leadership skill helped shape the American orchestra landscape throughout the twentieth century. Solti's tenure with the Chicago Symphony Orchestra was marked by numerous international successes. His recorded legacy is one of the most significant aspects of his career. Like Herbert von Karajan, he was one of the first conductors to seize upon the importance of recording technology as a meaningful aspect of contemporary musical life. Solti holds the record for having received the most Grammy awards. He personally won 31 Grammys and is listed for 38 Grammys (six went to his engineer and one to a soloist). He was nominated an additional 74 times before his death. He was honored with a lifetime achievement award in 1996 from the National Academy of Recording Arts and Sciences. In 1988, we was named "Musician of the Year" by Musical America Magazine. The City of Chicago renamed the block of East Adams Street adjacent to Symphony Center as "Sir Georg Solti Place" in his memory. Chicago Symphony Orchestra. Georg Solti, a City Remembers: Sir Georg Solti: The Chicago Years, 1969-1997. Chicago, IL: Chicago Symphony Orchestra, 1997. OCLC 37875191. Furlong, William Barry. Season with Solti; A Year in the Life of the Chicago Symphony. New York: Macmillan Pub. Co, 1974. ISBN 9780025420007. Robinson, Paul. Sir Georg Solti: His Life and Music. The Art of the conductor, v. 1. New York: iUniverse, Inc, 2006. ISBN 9780595399536. —, and Bruce Surtees. Solti. The Art of the Conductor. New York: Vanguard Press, 1979. ISBN 9780814908020. Solti, Georg, and Harvey Sachs. Memoirs. New York: Alfred A. Knopf, 1997. ISBN 9780679445968. This page was last modified on 23 July 2016, at 21:35.